Amada America Inc.’s Ensis-3015AJ (9kW/6kW) fiber laser cutting machine uses its Ensis-9000 and Ensis-6000 high-output oscillators. 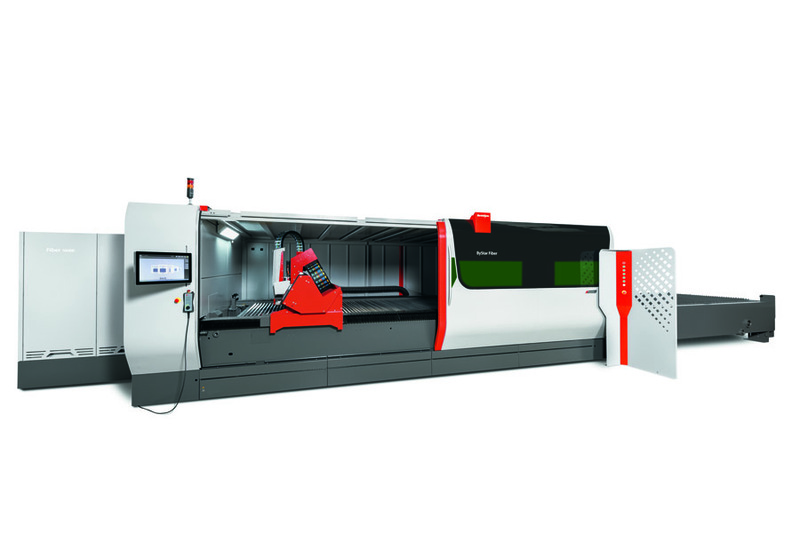 Ensis-3015AJ (9kW/6kW) is designed for high-speed stable cutting over the entire range of machining, from thin to thick sheet metals, which has been made possible by the evolution of Amada’s original beam control technology (Ensis technology) and the expansion of oscillator output from the conventional 3kW to 9kW/6kW. NC equipment is provided with the AMNC 3i, which can be operated easily like a smartphone. It is adapted to Amada IoT V-factory and visualizes machine operating results, including power consumption and processing costs, contributing to performance. Furthermore, it enables smart manufacturing through maintenance and support to maximize machine capacity as well as proposals to improve production efficiency. Ensis technology allows the laser beam to be controlled freely into the optimum beam form according to material quality and thickness. Additionally, the auto collimation mechanism is a new feature of the technology. Trumpf Inc.’s TruLaser 5030 fiber, which is equipped with the 10-kW TruDisk, powers through mild steel up to 1 in., stainless steel up to 1.5 in. and aluminum up to 1 in. The machine’s patented HighSpeed Eco cutting technology minimizes nitrogen consumption while maximizing productivity using the bi-flow nozzle. As a highly productive, universal machine, the TruLaser 5030 fiber is able to process complex contours and thin to thick sheets while keeping the cost per part to a minimum. The BrightLine fiber, CoolLine and PierceLine functions guarantee high-quality laser processing in thicker materials, as well. To take full advantage of the TruDisk 10001 laser, the machine was designed to achieve high acceleration and axis speeds resulting in significant productivity gains in medium thickness materials. The Smart Nozzle Automation with the integrated nozzle inspection feature includes the option to load and unload nozzles while the machine continues cutting. This minimizes setup time and operator intervention thus maximizing productivity. The Bystronic Inc. ByStar Fiber 10-kW laser cutting system is aimed at users who want to rely fully on fiber laser technology. With its triangle cutting bridge design for exceptional rigidity and accuracy, the laser cutter is able to deliver dynamic speeds and acceleration while utilizing X/Y linear drive technology. ‘Power Cut’ enables the ByStar Fiber to extend thick plate cutting capabilities to 1.125-in. thick with consistently high cutting quality. Cutting quality is ensured by the machine’s newly developed control, which automatically regulates the laser power, speed and focus. In addition, Bystronic has further increased the fiber laser’s versatility by providing access to the cutting area over the long side of the machine. The large sliding door allows users to insert express jobs and residual sheets at any time – even when large-scale jobs are running. 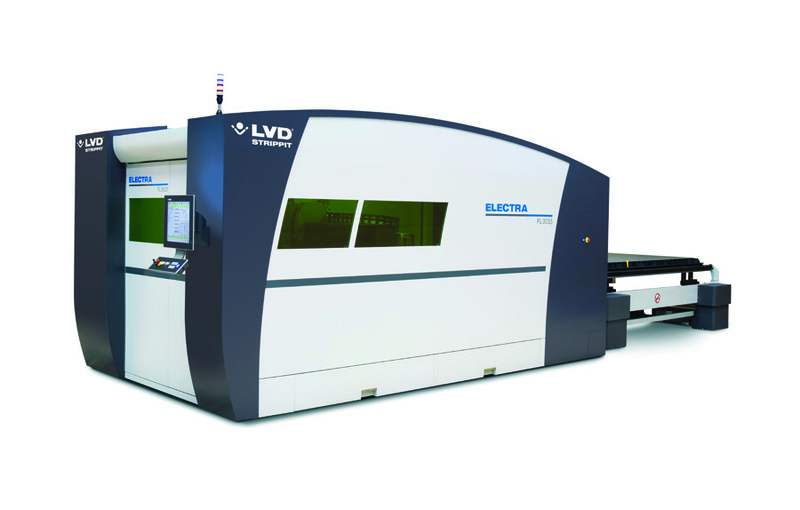 LVD Strippit now offers the Electra FL 3015 fiber laser cutting machine in a 10-kW configuration. The Electra FL provides ultra-high-speed cutting to at the highest possible output when processing ferrous and nonferrous materials in plate thicknesses up to 1.25 in. The laser features a welded steel mono-frame construction that provides exceptional stiffness and weighs 33,000 lbs. As a result, the Electra can maintain an acceleration of 2G during cutting without sacrificing part accuracy. To achieve the full potential of high-dynamic acceleration, Electra uses a lightweight yet rigid cast aluminum gantry driven by a linear motor and two synchronized motors featuring an integrated gearbox with the lowest possible inertia. The 10-kW Electra can nitrogen cut 5/16 in. steel three times as fast as a 6-kW fiber laser. 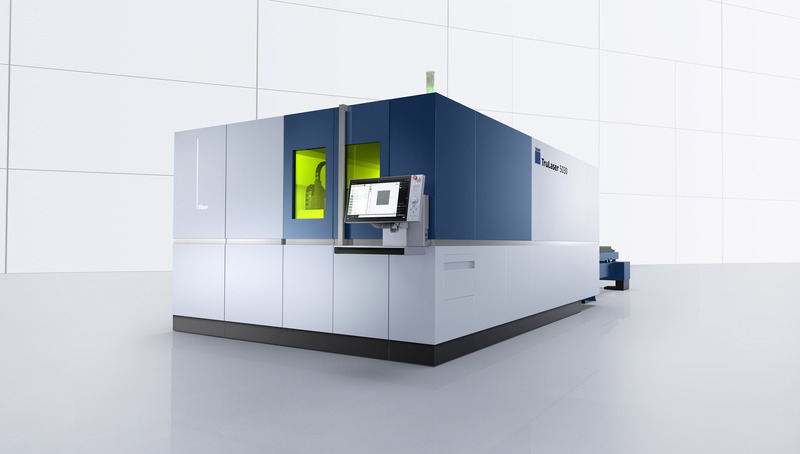 The Electra FL is equipped with the latest fiber laser cutting head which incorporates zoom focus, a technology that adjusts the focal diameter of the beam and enables independent setting of focus diameter and magnification. The PlateLaser laser cutting system from Piranha ranges from 2 kW to 12 kW power. The machine uses polymer granite for the base, which is heavier, more rigid and not susceptible to thermal changes. This makes the machine more reliable and stable at high speeds and accelerations. The linear drive motors throughout the X, Y and Z axes provide higher acceleration, faster positioning speeds and lower maintenance requirements. The high cutting speeds mean parts are completed much more quickly, so it’s important to get the material in and out of the machine as quickly as possible. Standard pallet designs require 60 to 90 sec. to change one sheet of material to another. The cantilever design of the machine also provides high acceleration and speed and allows a single drive motor, which simplifies maintenance and increases reliability of the system. 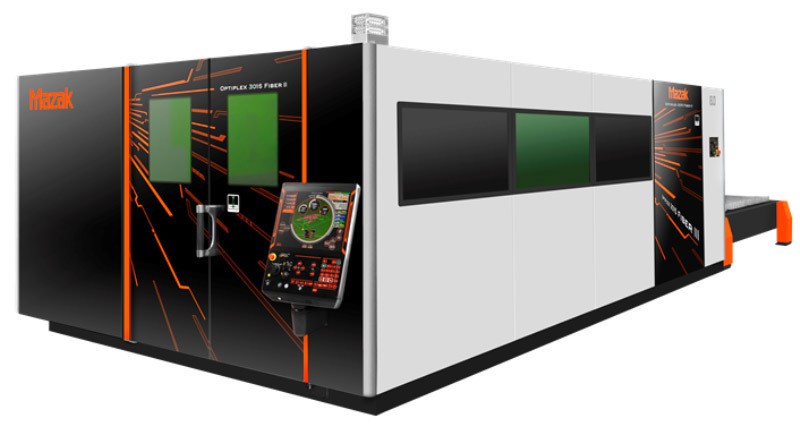 The Optiplex 3015 Fiber III from Mazak Optonics Corp. is a 2-D flying optics laser cutting system that utilizes an innovative control and drive package. The laser is available from 2 kW to now 10 kW. The new drive system provides higher productivity through high speed and high accuracy while the new PreviewG control offers a state-of-the-art CPU for unsurpassed operations speed, high response and high-speed machine motion. The control is a large 19-in. LCD touchscreen that operates similar to a smart phone or tablet for increased ease of operation. The Optiplex is engineered to be utilized with Mazak’s range of automated material handling systems. A two-pallet changer design with a helical rack-and-pinion positioning system that features high throughput and rugged construction delivers a combination of performance and value. 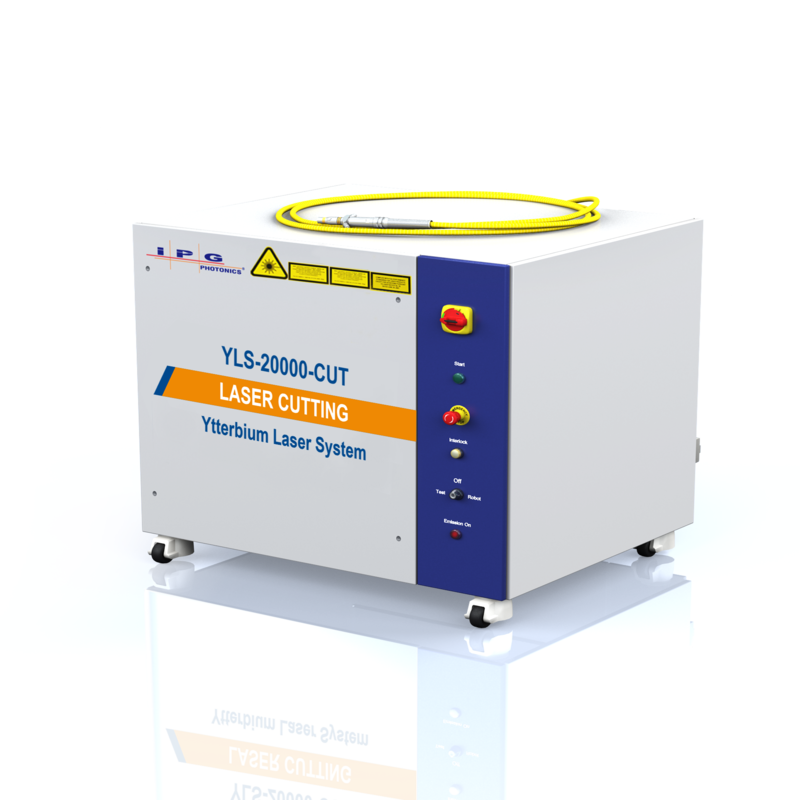 IPG Photonics Inc.’s YLS-CUT 1-20 kW laser series is ideal for demanding cutting applications. Supplied in the smallest form factor in its power class, the lasers are built for easy integration with cutting machines. They are packaged in a hermetically sealed cabinet containing an internal dryer, enabling the laser to be used in the harshest of production environments. The lasers incorporate the latest technical improvements in design of diode modules, fiber block, digital power supplies and control electronics, resulting in industry leading wall-plug efficiency of more than 40 percent. The new control system allows integrated control of laser and process subsystems. A dehumidifier is installed within the cabinet to ensure optimal internal humidity. Hot redundancy ensures 100 percent uptime with no change in power, record reliability and maintenance-free operation. The lasers are available from 1 kW to 20 kW with a variety of fiber delivery options, starting at 50-micron core diameter. 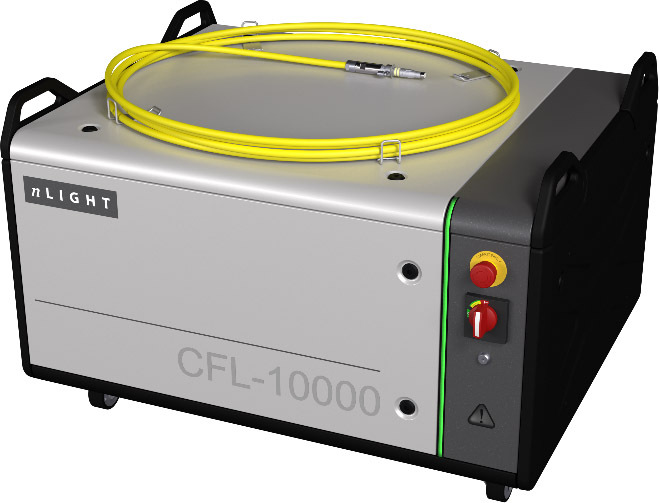 nLight Inc. is now offering its CFL-10000, the highest power fiber laser available in this form factor. Available in 6-, 8-, or 10-kW models, these fiber lasers are suitable for a wide range of materials processing applications. The lasers feature the latest in optical technology to improve productivity and part quality and are designed with durable components for maximum uptime and high operating efficiency. Back reflection protection provides uninterrupted failsafe processing of reflective metals with no damage to the laser while a modular design simplifies repair and maintenance. The lasers are designed for durability in harsh manufacturing environments and their faster piercing and processing times deliver smaller heat-affected zones. 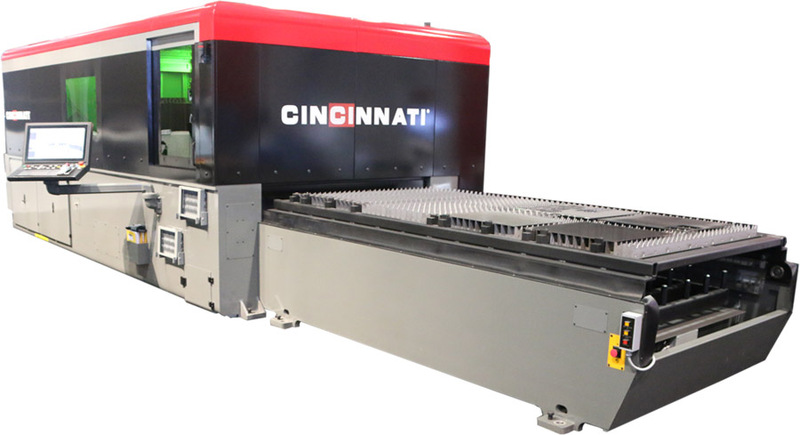 The CL-900 Series fiber laser system from Cincinnati Inc. offers high-speed cutting on thinner materials and lower operating costs. An intuitive HMI enables operators to produce good parts, especially beneficial in work environments where operators often switch from machine to machine. The HMI uses a Windows operating system and has a touchscreen display, easy-to-understand buttons and a full-size keyboard. A web cam is also available for easy monitoring of the cutting process. Thanks to its Dynamic Power Control, fast cutting speeds are available for any material on the fly. The following table sizes are available: 5 ft. by 10 ft., 2 m by 4 m and 8 ft. by 20 ft. The laser is available with 4-kW, 6-kW or 8-kW power.